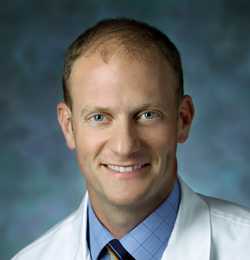 Dr. Moss’ research interests include tennis elbow, carpal tunnel syndrome, and post-operative pain relief. He currently lives in Maryland with his wife and children. He enjoys playing squash and golf. Dr. Moss is board certified by the American Board of Orthopaedic Surgery and the American Society for Surgery of the Hand. David P. Falk, BS, Ryan Scully, MD, David Moss, MD, and Margaret Shaffer, MD: “Pathologic Tuft Fracture in a Thumb- A Rare Presentation of Metastatic Endometrioid Ovarian Carcinoma” In: The Journal of Bone and Joint Surgery, 2017. DP Moss. “Total Elbow Arthroplasty: Indications, Surgical Technique, Outcomes.” Presented at 27th Annual Cherry Blossom Seminar, Washington, DC, 2008. DP Moss, CL Forthman. “A Biomechanical Comparison of Locking Screws Used in Volar Fixation of Distal Radius Fractures: How Many Screws are Necessary?” Presented at The George Washington University Health Sciences Research Day, Washington, DC, 2008. DP Moss, K Segalman. “Metacarpal and Phalangeal Fractures.” In: Hand and Upper Extremity Reconstruction, KC Chung (ed.). Elvesier Publications, London, 2008. DP Moss, CL Forthman. “Ulnar Artery Thrombosis Associated with Anomalous Hypothenar Muscle.” Journal of Surgical Orthopaedic Advances, 17(2):85-8; 2007. DP Moss, CL Forthman. “A Biomechanical Comparison of Locking Screws Used in Volar Fixation of Distal Radius Fractures: How Many Screws are Necessary?” Presented at E.F. Shaw Wilgis Lectureship in Hand Surgery, Baltimore, 2007. DP Moss, CL Forthman. “A Biomechanical Comparison of Locking Screws Used in Volar Fixation of Distal Radius Fractures: How Many Screws are Necessary?” Presented at Union Memorial Hospital Author’s Day Presentations, Baltimore, 2007. DP Moss, NT Tejwani: “Biomechanics of External Fixation: A Review of the Literature.” Bulletin of Hospital for Joint Diseases; 65(4):294-299, 2007. DP Moss, “Damage Control Orthopaedics and Spanning External Fixation.” Presented at Grand Rounds, Hospital for Joint Diseases, 2006. DP Moss, KB Raskin: “Bone Tumors: Benign and Malignant.” In: Core Knowledge in Orthopaedics: Hand, Elbow, Shoulder. Trumble TE (ed. ), Elvesier Publications, 2005. DP Moss, JR Rudzki, JC Wittig, R Henshaw, MM Malawer. “Minimally Invasive Burr-Down Technique versus En Bloc Resection for Treatment of Osteoid Osteoma: Results From a Single Institution Over a 20 Year Period.” Presented at American Academy of Orthopaedic Surgeons Annual Meeting, 2001. J Bickels, N Kahanovitz, CK Rupert, RM Henshaw, DP Moss, I Meller, MM Malawer. “Extraspinal Bone and Soft-Tissue Tumors as a Cause of Sciatica.” Spine; 24(15):1611-1616, 1999. J Bickels, N Kahanovitz, CK Rupert, RM Henshaw, DP Moss, I Meller, MM Malawer. “Extraspinal Bone and Soft-Tissue Tumors as a Cause of Sciatica.” Presented at Combined Meeting of the American and European Musculoskeletal Tumor Societies, 1998, and North American Spine Society’s 13th Annual Meeting, 1998.